Colmcille, possibly Donegal’s most famous son, was born at Gartan in the year 521 AD. He was a member of the Cinel Conall clan and was thus a member of the nobility of that era. His family decreed that he would be fostered by a holy man called Cruithneachain O’ Ceallachain. It was he who baptised him immediately after his birth and gave him the name Crimthann. This means ‘fox’ in Latin or ‘deceitful one’ in Gaelic. This early education began in Kilmacrennan though it appears that this was not the name of the district at this time. The schooling of Colmcille was at a place believed to be called Doire Eithne. This is said to have consisted of a small church and school and many have surmised that the most probable location of this was on a hilltop close to the present ruins of the Old Abbey in the village though one cannot be certain of this. It is while he was at school in Kilmacrennan that Colmcille became known as such. An account in ‘the life of Colmcille’ tells us that. ‘As the holy youth was being trained in the nearby monastic settlement of Doire Eithne (Eithne’s Oakwood), that is known today as Kilmacrennan, the children that played with him called him Colum (Dove) of the Cill (Church). That is how Colmcille was given his name’. Cruithneachan knew that the time had come for Colmcille to leave him and to begin his formal education. Cruithneachan apparently approached a holy man in the area to ask him about his views on this. ‘Write an alphabet for him now’. An alphabet was then written for him on a loaf. Colmcille was at that time sitting on the bank of a river. This was probably along the banks of the Lennon River. He ate one part of the loaf on the west side of the river and the other on the eastern side of the same river. Again the holy man spoke through prophecy saying. ‘The territory of this boy will be on both sides of the water, that is, of the sea; for one part will be in Ireland and the other part in Scotland, and he will spend some of his time in both places’. This prophecy later became true but nevertheless it is said that Colmcille left Kilmacrennan with a heavy heart, having enjoyed his time there with Cruithneachan. Colmcille is credited with the following verse, showing how fond he was of the place where he was first educated. However he did not forget his youth in Kilmacrennan and he later bestowed a monastery on Kilmacrennan. 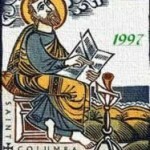 This Columban monastery was established sometime in the latter half of the sixth century. Colmcille had one sister, Mincoleth. As befitted a member of the nobility, she was married to a chieftan called Nenain. His fort or ‘lios’ was at Lios Nenain (Lisnennan) in Letterkenny. They had four sons and the Columban Monastery that was founded was left in their charge. It is from this time onwards that Kilmacrennan became known as such, having derived its’ name from the Gaelic, ‘Cill Mhic Nenain’, ‘the church of the sons of Nenain’. The name has endured since. Nenain set apart a portion of land on the northern side on the monastery. This was an area of sanctuary or protected monastic lands. In Gaelic, this is referred to as a ‘Tearmann’ and it is from these lands that the neighbouring district of Termon got its name. Doon Rock was included in these lands. The monastery is believed to have survived until 1129 when it was taken from the possession of the O’Donnell Chieftains and destroyed by a rival chieftain, named Taircheirt. The monastery was certainly a ruin by the time the Franciscan Order established an Abbey there in the sixteenth century. It is interesting to note that the monastery had at this stage become very closely linked to the O’Donnell clan. This may best be explained by the belief that Kilmacrennan in olden times was the metropolis of Clann Lughaidh and it was at their fortress, Dun Rock that their Chieftains were at times inaugurated. Colmcille was a first cousin of Muintir Lughaidh and it was the marriage of his sister, Minecoleth to one of the Lughaidh clan that mainly enabled the O’Donnell clan to associate their name with the saint of Dun. There is no trace nowadays above ground of this Columban monastery though an archaeological excavation of the site might indeed reveal some treasure troves! Perhaps it is time to get our trowels out. Kilmacrennan continued to be a hive of activity through the Middle Ages. Such was its’ importance that it gave its’ name to the surrounding Barony and it is clear that the O’Donnell Chieftains were to the fore in its’ affairs. However, there is little mention of Kilmacrennan until the early sixteenth century when the O’Donnell Chieftains built a Franciscan Friary, known locally as the Abbey at Kilmacrennan. Apparently this was a thriving monastery that enjoyed an excellent reputation. It had an idyllic setting for an Abbey, enjoying a good view of the surrounding countryside. It was nestled between the Lennon and Lurgy rivers, providing good water and plentiful fish. It housed priests, lay brothers and school children. Manus O’Donnell had a great interest in the life of Colmcille and it was he who wrote ‘Beatha Cholmcille’ in 1532, a book that detailed much of the saint’s life story. Manus was a descendant of Colmcille and was grandfather to the famous Red Hugh O’Donnell. One of the most fascinating images in the history of Kilmacrennan is the fact that the O’Donnell Chieftains were inaugurated in the parish. It is believed that some twenty-five O’Donnell Chiefs were crowned there between 1200 and 1603. The religious part of the ceremony took place in the Abbey while the actual crowning took place at nearby Doon Rock, then in the Parish of Kilmacrennan. The inauguration was a solemn affair that had particular customs and superstitions. The Chieftain elect stood barefoot in the imprint of the first Chieftain that was shaped or moulded into the inauguration stone. The incoming Chief received a straight white rod known as ‘An Slat Ban’. It was expected that any judgement that he would pass would be as straight and pure as the white rod that he had just received. The inaugurator was the Abbot, usually a member of the O’Friel Clan. The importance of this is still maintained in the district as the O’Friels are the traditional guardians of the famous Gartan Clay. The name of a holy man associated with the Kilmacrennan area many centuries ago has lived on in the area though there is little actually known about this man. The name Lector implies a teacher and many credit him with the blessing of the holy well at Doon Rock but it appears that he earned his reputation as a healer of considerable note and that he cured many people of ailments and sickness. It is said that when he was close to death that he signalled that his powers would live on after his death. Lector blessed the well and said that those who applied the waters of the well at Doon would benefit from his cures. O’Friel certainly had no shortage of believers. In an article on ‘Doon Well’ in the Derry Journal in 1930, many centuries after his death, it was said ‘there is hardly in the whole county of Donegal a single Catholic family that does not always keep in their home, in some safe place, a bottle of water from Doon Well’. Other priests have also been named as having blessed this well but many believe that the tradition of pilgrims began with O’Friel. It is said that he is buried inside the ruins of Kilmacrennan Abbey. Rev. John Mc Nulty was Parish Priest of Kilmacrennan in 1911. He was seen as a strict disciplinarian and when he heard that some pilgrims were depositing copper coins on a stone near the well, he feared that the sanctity of the place would eventually be destroyed by money, he scattered the coins irrecoverably over the moor’. That soon ended that custom. In olden times, many people from the area who were emigrating to America or other lands from Donegal knew in their hearts that there was little chance that they would ever see their home again. Many went to pray at Doon Well before they left. Though no particular day is associated with Doon Well, the busiest days on which pilgrims attended in olden times were the Feast day of Colmcille. To this day many people visit Doon Well as a place of pilgrimage. In recent times, the tradition of praying at Doon on New Years Eve and May Eve has grown stronger in the locality. It is believed that Red Hugh was the last of the O’Donnell Chieftains to have been inaugurated in Kilmacrennan Abbey. His defeat at the battle of Kinsale, the flight of the Earls and the defeat of Cahir O’ Doherty at Kilmacrennan signalled the end of the rule of the Gaelic Chieftains. The English brought in laws that closed the monasteries in 1603. This spelt the death knell of the Abbey and it is said that Kilmacrennan Abbey closed in 1608. The lands were sold to wealthy landowners. Trinity College, Dublin became the owners of the Abbey and some surrounding lands. The Abbey was abandoned; its roof eventually fell in. It is likely that the remains of some Franciscan monks lie buried near the Abbey walls. A new Protestant Church was built across the path from the Franciscan Abbey in 1622. All that remains are the lower courses of three of the walls and part of the gable. The battlemented tower that can be seen is believed to have been added on to the church during renovations in the 1700’s. This Church was in use until a new Church of Ireland was later built at Main Street, Kilmacrennan around 1846 and has at least five dressed stones incorporated in the building that came from the original Franciscan Abbey. The rector credited with the building the Church was Dr. Hastings. The cost of building the Church was around £1’200. Another project, which he undertook during this time in Kilmacrennan, was the building of a Rectory. The Church of Ireland on Main Street is dedicated to St. Mark and St. Finian. Leiter Presbyterian Church was built during the Famine years. The Minister in charge of building this was Nathaniel Rogers, a native of Manorcunningham. Rogers was also a doctor who was at hand to help the needy. He was also very helpful to the needy during the Famine, providing hot milled oats to the people. This is our Parish Church. The Church was opened in October 1904, the foundation stone having been laid on St. Patrick’s Day, 1903. It is a simply designed yet beautiful building. Fr. Mc Kay was the Parish Priest who undertook the task of building a new chapel. He had been appointed Parish Priest in 1900. He knew that they chapel was in bad condition and he got permission off the Bishop to build a new church in Kilmacrennan. This church was practically on the same site as the old one it replaced. In an ad in the Derry Journal that sought funds for the new church, Fr. Mc Kay stated the chapel that was there at the time ‘wouldn’t even make an interesting ruin’. The architect was M. J. Callaghan of Letterkenny while the builder was Daniel Doherty of Derry. One of the most impressive features of the chapel when the then new St. Eunan’s Cathedral was built. The holy water font at the entrance to the chapel also has an interesting story. The font came from Templedouglas and many believe that it is the same actual font that Colmcille was baptised in. Golan Chapel and Coole Chapel are the other churches of the Parish. O’Neill and O’Donnell led much of the Gaelic Chieftains resistance to the English Crown’s advances in Ireland during the Nine Year War but their time was up after their defeat to the English at the battle of Kinsale in 1601. The departure of the Ulster Chiefs in the Flight of the Earls in 1607 hastened the end of the Gaelic Clans but Sir Cahir O’Doherty, a Chieftain from Inishowen continued with the rebellion against the English. Cahir O’Doherty began a rebellion in 1608. His lands near Inch Island in Inishowen were under threat from English settlers. He split his army into two groups and they raided some enemy forts and got guns and gunpowder for their rebellion. One of the groups captured doe Castle near Creeslough. It is said that they tricked the guardians of the Castle into believing that their livestock were being attacked outside by foxes. Instead O’Doherty’s men attacked the guardians. They soon took possession of Doe and made it his headquarters. Word of the rebellion soon reached Dublin Castle and it was decided to send more troops to Donegal and Derry to defeat the rebellion. O’Doherty’s men were causing trouble across the whole North West and attacked Culmore Fort in Derry, home to one of his main rivals. When O’Doherty heard about the approach of the English, his troops hid out in the Glenveagh area. This was a heavily wooded area and it would be difficult for enemy troops to go in there. His troops did manage to kill Henry Og O’Neill, who was fighting with the English. The English sent more troops into the area. O’Doherty did not stay in the one area waiting to be attacked. Instead he led a band of his troops in several more attacks. O’Doherty’s wife was captured shortly afterwards. He soon met his own match when he clashed in July 1608 with a group of government troops who were beginning to get ready to launch an attack on Doe Castle, still in the hands of the rebels. This clash has sometimes been called the Battle of Kilmacrennan. It actually took place close to Doon Well. While both sets of troops were in battle against each other, more government troops surprised O’Doherty’s men from the sides. Cahir O’Doherty was shot dead. His head was sent to Dublin Castle where it was placed on the spikes of the gates. The way was then clear for the English. It wasn’t long before the Ulster Plantation was in full swing and English and Scottish settlers began to settle in the area but one of the last stands by a Gaelic Chieftain took place in Kilmacrennan. While Donegal was far removed from the main activity of the United Irishmen Rebellion of 1798, a man from the Kilmacrennan area, Manus ‘the Pike’ O’Donnell took his own place in Donegal’s story. Known locally as Manus Eamonn Bhriain, he was born in Goaldrum in Kilmacrennan in 1758. Unlike many of the other youths from that area at that time Manus received a good education. It is said that he attended a hedge school near his home for a while. His teacher there was called Master Mc Granaham. Manus showed good potential as a student and was sent to study in Bishop Coyle’s Academy in the school and he eventually returned home. However he had furthered his education and had spent some time studying subjects as Latin and Greek. When Manus returned home, he settled in the area. He married a girl from the Glenfin area called Brid O’Donnell from Glassagh. It is said that Manus met her at a holy pilgrimage or ‘turas’ at Gartan and was keen to make her his wife. However Brid’s father was of ruling Chieftain shock. It is said that he demanded a note be written in Latin requesting his daughter’s ‘hand in marriage’. Manus was able to do this having earlier studied Latin. Brid was soon his wife. It was fairly common for O’Donnell’s to marry their namesakes. Manus took a keen interest in politics and soon became a captain of the United Irishmen in the locality. His position in the illegal organisation was betrayed to the authorities by a Sub-Constable in the area, a man called Mc Grath. The informers information led to the arrest of O’Donnell in his bed in Goaldrum early one morning by a band of Redcoats. He was taken to Letterkenny. O’Donnell refused to name his fellow compatriots in the organisation. This infuriated the authorities. The lure of a bribe didn’t appeal to O’Donnell either. He said that he ‘had but one son and it would never be said to him that he was the son of an informer’. After spending several months in jail, O’Donnell was transferred to Lifford where he faced a trial before Captain Murray. The case against O’Donnell did not succeed mainly due to the fact that the informer tried to rescind his evidence. However the case didn’t rest there. Manus had gained a reputation as a skilled user of the pike, the main weapon of the United Irishmen. The President of the Military Court at Lifford told Manus that he would only gain his freedom if he agreed to fight a mounted dragoon armed only with his pike on a twelve-inch shaft. It didn’t seem a fair contest. There was a large crowd in the field in Lifford to witness the combat. The mounted dragoon charged at O’Donnell but he deftly managed to use the pike sever the leather strap that connected the horse’s reins and bit. The horse was startled and the dragoon was soon unseated. Manus stood over him, placing the pike to his throat. He had gained a victory against the odds; a classic case of David versus Goliath. There are conflicting stories as to where Michael Logue was born. Some reports indicate that he was born in Carrigart while others claim that he was born in Kilmacrennan in October 1840 and that he moved to Carrigart as a young boy. The house in which he stayed in Kilmacrennan was that of his uncle, John Durning, a shoemaker who lived on Main Street. Michael’s mother was from this home, which is on the left below the Garda Station. The unoccupied house is clearly visible today. Local legend tells us that Michael wasn’t too keen on attending school in his youth, preferring to stay in the workshop of his uncle. This didn’t please John Durning, as he was keen that his new nephew would get a good education. The school in question was the Robertson School, now used as a Parish Hall adjacent to the Church of Ireland on Lower Main Street. Some Catholics attended these schools though they were mainly Protestant children there. It is said that Master Craig, the school teacher in the Robertson Hall in Michael’s youth was very proud of his achievements. Michael Logue became a priest in 1870 and a Bishop in 1879. It is said that Master Craig was so keen to attend his consecration as Bishop of Raphoe despite being incapacitated that he was carried in to the ceremony on a stretcher. Michael Logue was appointed Bishop of Raphoe in 1879 and later became Cardinal. Cardinal Logue died in 1924. The past century has seen the disappearance of many features that were once central to life in Kilmacrennan Parish years ago. We have spoken to our parents, grandparents and neighbours in an effort to get an idea of some of the main changes that they have seen. Neil Doherty, a local historian came to our school to talk to us about the changes that he has seen in his time in Kilmacrennan in his time. Neil spoke to us about many different changes but he felt that the changes he has seen ‘in the last fifteen or twenty years have been greater that those for many years before that’. Here are some of the changes that Neil thought were important. The Fair Green is the area adjacent to the new Kilmacrennan Community Hall, on the Kilmacrennan Rd. In olden times, this green was particularly busy for the monthly fair as it was there that the fair was held. Kilmacrennan fair took place on the first day of each month except if it fell on a Sunday. Cows were sold at the ‘cow market’ adjacent to the new Community Hall on the land owned by Lord Leitrim. Horses were lined up along where the wall now stands opposite the Anglers Haven Pub, while the sale of the sheep took place where the wall of the car park of St. Columba’s Chapel is today. A V-shaped hedge was there in olden times. Farmers travelled long distances and they usually had sheepdogs with them, as ‘sheep were devils for any gap in a hedges’. Neil explained how the farmers often used a ‘split rush’ to tie the sheep to the hedge. This rush was cut and seasoned and was sometimes used for thatching. The fairs stopped in the 1950’s. As with many Donegal villages, threshing was an important feature in Kilmacrennan. It was there that threshing, or ‘thrashing’ as it was called locally, took place. This began in August of each year, first with hay then with corn, both of which were a staple diet for cattle and sheep. The location of a Corn Mill on the banks of the Lennon has been preserved in the names of Milltown, Milltown Bridge and the Mill bridge Bar in the village. This was a Mill that was on Lord Leitrim’s land and was worked until the 1860’s. The present Garda Barracks are located on Kilmacrennan Main Street but Neil Doherty explained to us that this was not always the case. An RIC Barracks was located in a two-story building across from the new Community Hall, overlooking the Fair green market, where the cows were sold on fair day and there was a barracks adjacent to Paul Mc Fadden’s house on the Milford road. The Post Office in Kilmacrennan is located on Upper Main Street and the postmaster is Edward Fries. However we learned that this was not always the case as the Post Office was housed in Campbell’s, a building now demolished on Lower Main Street until about 1910. This building is directly opposite Lafferty’s flats today. In olden times, Lafferty’s was Samuel Burn’s house and shop, built in 1899. Across the street here, set into the pavement, was a quern stone, used for grinding corn in olden times. Taylor’s Hotel was a prominent hotel on the Main Street in the early years of the twentieth century. It later became Mc Cafferty’s Village Tavern and is now the Village Court. The Angler’s Haven is another Main Street landmark. For many years it was owned by the Cullen family but passed on to Mc Fadden’s in later years. It was formerly a Temperance Hotel. Horse racing was a popular pastime in Kilmacrennan in years gone by and while races took place at several places, one of the venues for the races was a large field close to the banks of the Lennon River. This field is on the left hand side of the road as one approaches Kilmacrennan village from Letterkenny. The main race was known as the Tirconnaill Derby and was held each July. The type of racing was known as ‘Flapping’. This was horse racing that wasn’t under the rules of the Turf Club. The first races were run on a narrow track that ran parallel to Field’s Hill. The course was approximately ¾ of a mile long, but the horses were forced to do a U turn in order to complete the course. ‘Several scuffles took place on the field while the jockey’s enclosure became the scene of angry exchanges between owners, jockeys and officials. It took Pat Coyle, W. Russel, M. Fries, J. Burns and Paddy Rodden a considerable time to restore order, and even then only four competitors out of a list of twenty seven entries took part in the next race. It was felt that the rest of the owners had boycotted the race. The last races were run in 1952 when the prize pot for the Tirconaill Derby was £100. In later times the racer were run on the Rosemount Cottage course. There is a new housing development underway in the village that is called The Racecourse. Kilmacrennan Railway Station wasn’t strictly in the village of Kilmacrennan. It was situated at Doon. The station was quite busy at times as there was a strong tradition in times gone by of people coming to Kilmacrennan, on a day of excursions to Doon Well or to fish in the waters of the Lennon and Lurgy rivers. The station was also very busy on days when the pilgrims were visiting Doon Well. The first train through Kilmacrennan Station was in 1903 and the line stayed open until 1947. Neil believes that the distance of the station outside the village was a problem. In early days, local merchants had to travel to the station for their wares. This wasn’t easy when few had transport. Lorries and delivery vans eventually began delivering to the shops meaning that fewer and fewer people were using the railway. Neil Doherty gave us the last date of an official through the village as 6 January 1947, though other trains ran for a short while ‘collecting sleepers and other things’. The different religions began to take an interest in schooling matters in the nineteenth centuries with a view as to what was being taught. This was certainly true in Kilmacrennan. Kilmacrennan No. 1 School was built adjacent to the Church of Ireland on Main Street Kilmacrennan sometime in the 1820’s. It was a ‘Robertson School’; that is one of the 28 schools in the country that received funding from the will of Colonel Robertson, an ex army officer who had directed that £9’000 left in his will be spent on building schools, teachers salaries and books. Though the school was affiliated to the Church of Ireland, some Catholics did attend there. This school closed in 1969 with its’ remaining students moving to Portleen National School. The building is now used as the Church of Ireland Parish Hall. ‘…There were few comforts..There was no central heating and no water, and the toilets at the back of the building. ‘Boys’ and ‘Girls’ were divided by a stone wall. In the wintertime each pupil brought a ‘peat’ each morning to keep the fire going, and if there were not enough ‘peats’ for the day then the fire died out. There was no turf sack outside! If you were thirsty the pump was near the chapel entrance – a good excuse in all weathers to get out for a run’. Neil Doherty helped move some of the blackboards and books from the old school to the new one, St. Columbas National School built in 1935. Other primary schools within the parish boundaries include Cranford National School and Rathdonnell National School. St Colmcille was born in Gartan in Co Donegal in the year 521 AD. He was first educated in Kilmacrennan. The young boy was given the name Colm at birth, but Colm spent so much time praying in the church that he became known as Colmcille, which means ‘Colm of the Chruch’. Colm left home and became a monk. Other young men joined him and they built a monastery in Derry and at several other places. Colmcille wished to have a book of the gospels for his own church. 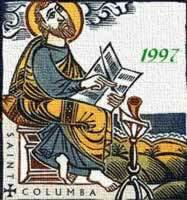 Every night for more than a year, he spent several hours, working with a quill pen and parchment, making a copy of a book of the gospels that belonged to another monk. Colmcille never asked for permission to copy his book. When the other monk saw Colmcille’s beautiful book, he was jealous and went to the High King to tell him what Colmcille had done. ‘Colmcille, you have worked long hours, making a beautiful copy of another person’s book’, the High King said. ‘But I think that you cannot keep that copy. The law says: “To every cow her calf; to every book its copy”. But Colmcille was angry. He gathered an army and fought a battle in which many people were killed. Colmcille realised that he had done wrong and he asked a very old monk what penance he should do to make up for his evil deed. He was ordered to leave Ireland and to go to a pagan land and that he was to stay there until he had converted as many people to the Christian faith as had been killed. He was told never to see Ireland or to walk on Irish soil again. Reluctantly, Colmcille did what he was ordered. Some time later, he and twelve other monks sailed from Inishowen in Donegal and landed on the island of Iona, off the coast of Scotland. They set up a monastery there. They lived for many years and in time they converted many of the people of Scotland to the Christian faith. He died in the year 597 AD. His feast day is celebrated on the 9th June each year. Our school is named in his honour. When was he first educated? Name one place where Colmcille set up a monastery? What did Colmcille do that annoyed another monk and the High King. What was he ordered to do as penance? 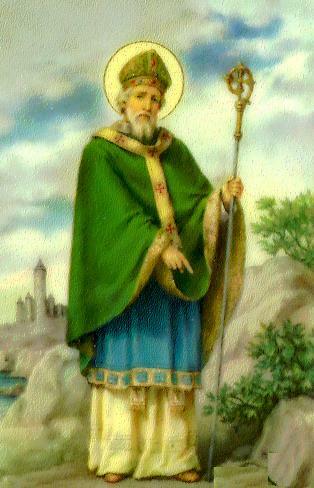 St Patrick was born in Britain. When he was a young boy, he was captured by a pirate king called Niall of the Nine Hostages. He was brought to Ireland and sold to Milchiu as a slave master. Patrick spent six years herding sheep and pigs on Sliabh Mis in Antrim. Patrick was a holy boy and he prayed to God each day. One night he had a strange dream in which an angel told him that he was to travel to the coast and to go home. Patrick saw one of the pigs acting in a strange way. It kept running away from all the other pigs and looking back all the time. Patrick knew that the pig wanted him to follow it. The pig rooted in the soil with its snout, tossing out gold coins. Patrick told Milchiu but the slave master grabbed the gold from him. Patrick set off for the coast and found a ship waiting. He went back to Britain. When Milchiu later looked for his gold, he found that it had turned into a big, black stone. Patrick later became a priest and then a bishop. He returned to Ireland in 432 AD, hoping to convert the people of Ireland to Christianity. At that time Laoire was the High King of Ireland. It was Easter time and the pagan priests or druids were to light a fire on the Hill of Tara to honour their gods. No other fire was to be lit in Ireland at this time. Patrick and his followers were celebrating the resurrection of Christ. They lit a fire on the Hill of Slane. Laoire, the High King was angry. His soldiers brought Patrick back to him. However, the king was amazed as Patrick explained to him, using a shamrock, that there were three persons in the one God. Patrick converted many of the King’s followers to Christianity. Patrick spent about 30 years, travelling around the country, preaching the message of God. He visited Donegal and spent some time on Lough Derg. St Patrick’s purgatory on the island is named in his honour. 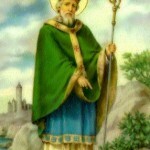 St Patrick is the patron saint of Ireland. We celebrate his feast day on the 17th of March each year. Who was Patrick sold to? What work did Patrick do on Sliabh Mis? When did Patrick return to Ireland? Who lit a fire on the Hill of Tara? Where did Patrick and his followers light a fire? What plant did Patrick use to explain that there were three persons in one? Did Patrick ever visit Donegal? 10. When is St Patrick’s Day? Can you find any further information on Lough Derg’s famous pilgrimages?